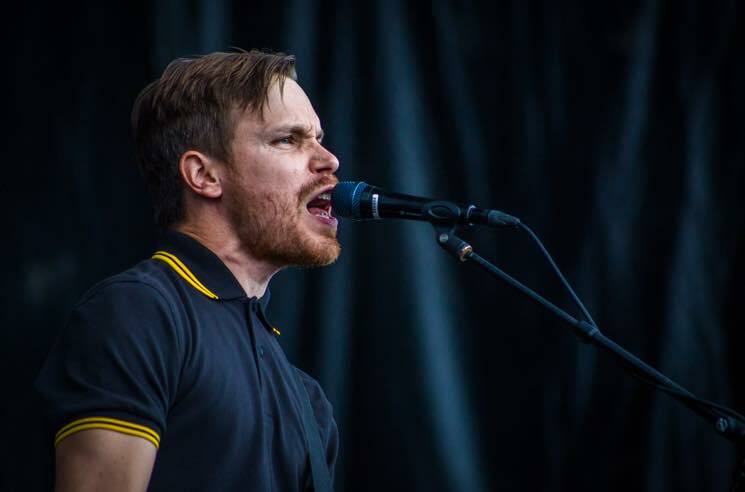 Steve Adamyk Band saw one of their biggest hometown crowds yet at RBC Bluesfest last night (July 15), with several hundred people of all ages taking in their pop-punk onslaught. A sea of Red Hot Chili Peppers shirts gave it away that most of their audience was early for the California headliners at City Stage, but the timing couldn't have been better for Steve Adamyk and company as they gear up to release their fifth full-length album, Graceland, later this month. Serving as frontman and the group's namesake, Adamyk currently plays alongside members of Montreal punks Sonic Avenues, though the bonus addition of the Acorn drummer Pat Johnson at their Bluesfest set made for an Ottawa-Montreal supergroup. Despite the slow-warming crowd and a downpour of rain, they delivered a fun (if a bit formulaic) romp of melodic, fast-paced punk. Their 20-song set was littered with high-energy bursts, from Graceland's opening cut "Through My Fingers" to the fury of "Had a Heartattack" and the powerful harmonies of "Not A Witness," with songs rarely running over three minutes. Adamyk and guitarist Max Desharnais' voices in particular drove most of the catchy harmonies through classic punk "whoa-ohs," showing that Steve Adamyk Band are at their strongest when they're screaming in sync. By "Wait For Your Number," their set began to fall into the formula of a pump-up verse followed by a thrashing chorus with a short phrase repeated over and over for a hook. Sure, it's the pop-punk rulebook, but Steve Adamyk Band are better off when they tear out the pages. For instance, "High Mile", though announced as a slower song, featured a fantastic intro of distorted guitar that rang through the sky, perhaps powerful enough to unintentionally summon the rainstorm that followed. The group made up for their set's many plateaus by closing with a run of songs from Graceland. With Johnson and bassist Sebastien Godin's pummelling rhythm section at the core, "Carry On", "Die Dead Forever" and "Swallow You Whole" stood out as some of the band's strongest material to date. Steve Adamyk Band aren't breaking new ground, but at least the ground they've built is fun to dance on.